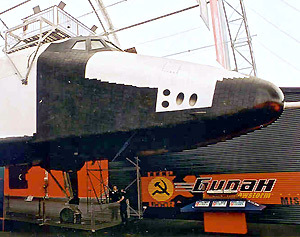 Built in 1984 OK-GLI is the Russian equivalent of the American flight shuttle. This one wasn't launched from a modified Boeing 747 like the american model, OK-GLI had turbojets to be able to take off and land like a plane. OK-GLI was intended for the flights tests. It had same the aerodynamic , gravity centre and inertial properties that the final model. It differed by the addition from turbines AL-31F at 4° upper from the horizontal axis. The analog shuttle was equipped with the same systems as the final model, with the ejector seats, the navigation system, the accelerometer and temperature gauges. 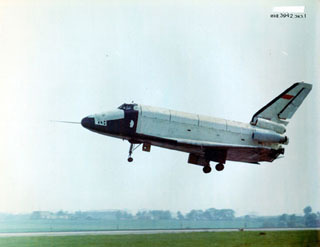 The analog shuttle was used with the transport aircraft VM-T to test dynamic characteristics of VM-T/Navette and the fastener of the shuttle. After assembly it was used for tests in subsonic flight and to develop the flight systems and automatic landing. OK-GLI took part in many air shows, in particular at MAKS in March 2000. Then it was sent in Sydney by boat to take part in a show during 2 years. After, it should have make a trip in the largest Australian cities and in Southeast Asia. Between 2004 and 2008 it was stocked in the kingdom of Bahrain because it should have been participated at a show wich finally didn't take place. Then it was sell to a German museum (Sinsheim/Speyer Technik Museum) in 2004. Its moving to the museum finally took place in early 2008 after longs legal conflicts. News of OK-GLI on the blog. More pictures of OK-GLI in the site's gallery.